Thanks to our revolutionary way of renewing and washing your concrete, your driveway or patio can take on new life and stop being the eyesore it once was. Plus, with our experts on hand, renewing your concrete is our specialty. Sit back and let us transform what used to be a hassle into a breeze. All it takes is one time for someone to ruin your nice concrete driveway. If pressure washing concrete is done without precision and attention, it’s easy to chip away cement and damage its integrity. While it might look good at first, fissures and splits made during a bad wash can cause vegetation to grow through and cause bigger cracks. We do not use caustic acids or damaging pressure levels, so you can rest easy knowing that when we leave your property, your cement is in better shape than it has ever been, and it’s going to stay that way. 100% Satisfaction Guaranteed. Our company is known for being committed to providing consistently reliable service in a timely and professional manner. Our concrete cleaning employees are professionally trained, highly skilled and courteous. What sets us apart from other exterior maintenance companies, is we actually enjoy what we do, and are dedicated to serving our customers. Give us a call or fill out a contact form to set up your free estimate! Our concrete pressure washing services will restore the flat surfaces around your home or business. Over time concrete driveways, sidewalks, and other flat surfaces build up dirt and start to lose their appeal. Contaminants darken the surface of everything from concrete to pavers, stone, and more. Concrete pressure washing not only keeps your flat surfaces looking better, but also makes them safer to walk on. Algae, mold, and other contaminants can make these surfaces slippery and hazardous. Not only will our driveway and sidewalk pressure washing make your property look great, it will make it safer too. Using a combination of soft washing techniques, and traditional surface cleaning, we can safely restore your driveway, pavers, stone, brick, or other flat surfaces, such as pressure washing decks & patios. One of the first things people notice, even if not consciously, is the driveway and sidewalks when they approach a building or a home. Keep your curb appeal at it’s best with regular driveway pressure washing. Cleaning concrete and pavers or other flat surfaces sounds easy enough, but it can also be very easy to mess up. Improper cleaning with high pressure can even damage concrete. Most of the time the problem with improper cleaning is just poor results, but at worst it can mean permanent damage. Concrete is tough, but ultra high pressure water is tougher. We use the latest in flat surface cleaning technology to safely clean and restore all kinds of flat surfaces. We accept jobs regardless of how big or small they are. 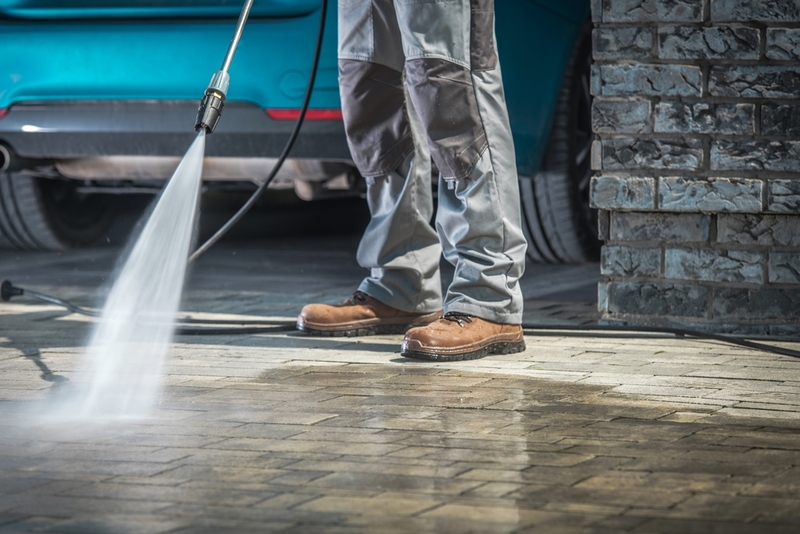 Whether it’s cleaning concrete patio food stains or concrete driveway oil stains, no one can beat our crew when it comes to pressure washing stained concrete. Remember that using a pressure washer is something that requires skill, knowledge, and having the right equipment. Columbia Brothers Power Washing has been cleaning concrete- commercially and residentially for years. Our team of certified experts are prepared and fully equipped with the correct tools and best washing techniques in the industry. We use the appropriate pressure and the right cleaners and detergents for the surface and stains. At times we may use a method called soft wash to clean the area. This ensures your driveway is being cleaned with the safest techniques and done properly. Each member of our team will be happy to answer any questions and explain our cleaning techniques and how it will benefit you. Fast scheduling, great communication, 5 star results! Wow, i am impressed with the results from having you guys pressure wash our driveway! it really has improved the appearance of our home! 5 star service!! Columbia brothers does great work, and can clean stubborn stains!! We saw proof of that when they cleaned our driveway! Thanks for the amazing service, and cleaning our driveway so well! Our neighbors thought we poured a new slab it looks so good! Our commercial driveway was embarrassing before, very dirty and full of algae. But thanks to columbia brothers power washing services they helped us get it cleaner than we've ever seen it! 5 stars!!!!! Great and effective methods! Thanks for helping renew our driveway!! We know we can always trust this company. They have always showed up on time and perform 5 star services every time!